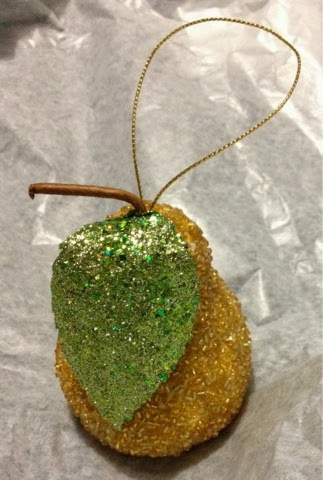 It's a glittery pear Christmas tree decoration! 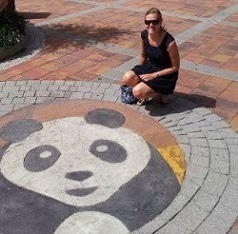 Isn't it fab?! Today went from an empty, plan-free firework recovery day to lazy dim sum lunch with friends and a wander around the Harrods gift shop. Wonderful, relaxed and happy; and also with a new Christmas bauble. Yup, it's the little things that make me happiest too. Such a pretty bauble! We get one new ornament every year and paint the year on it. Just thought... perhaps now you are married, this will be the begining of your 'our' ornaments. Maybe next year you will find 2 turtle doves? Maybe the start of my married Christmas decoration collection, but I don't think he'll be claiming ownership!